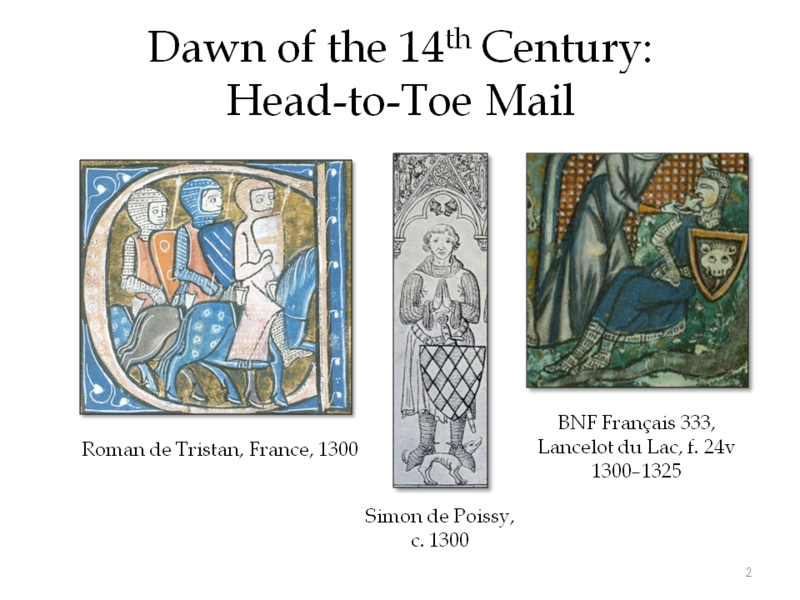 This article is a webbed version of a paper I wrote and presented for a DISTAFF session at the International Congress of Medieval Studies, in May of 2013, on the Western Michigan University campus. It could not have come into existence without the excellent work of five people: Bertus Brokamp, Sean Manning, Randall Moffatt, Mart Shearer, and Michael Zander. 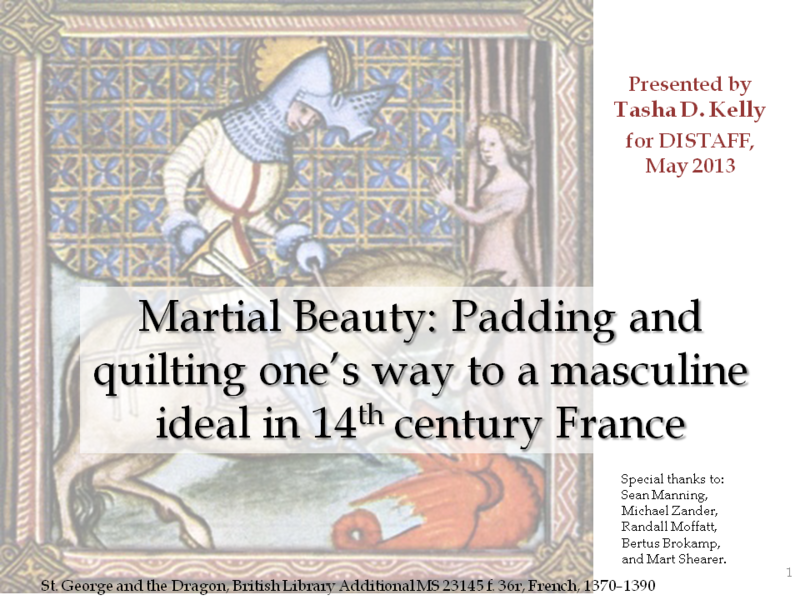 Allow me to tell a tale about the connection between the humble textile foundation of martial harness in the 14th century, called the aketon, and the subsequent popularity of padded, quilted garments occurring in France as a peace-time fashion. The former inspired the latter at a time of social change which was boldly reflected in the clothing people wore. In the unremitting climate of battle that took hold in France by the middle of that century, steel plate technology took fast steps forward, leading to a new silhouette for the martially inclined man. In turn, bellwethers of style leaped to borrow the look of the armoured man’s rounded breast plate by padding their doublets. Shortly thereafter, a new breed of quilted martial surcoat worn over men’s martial harness arrived on the scene—the coat-armour—harkening back to the basis of the padding and quilting craze: the no-nonsense aketon.1 This evolution in the applications of padding and quilting tells the story not only of France’s adoration for the technique, but of its versatility across purposes, both peacable and violent. 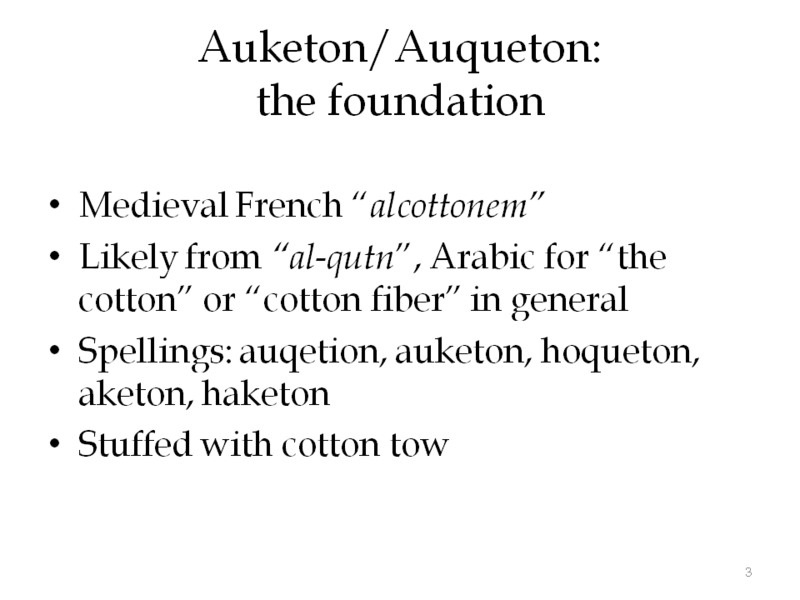 The English use of the word “aketon” or “acton” appears to have derived from a French word, “auqueton”, which in turn appears to have derived from the Arabic “al-qutun”, translating roughly to “cotton”. It has been proposed that the term came to medieval France by way of Islamic Spain or perhaps through Crusaders returning from the Levant. Note, we modern people hear the word “cotton” and think of cloth, but this would not have been so in medieval France, where the technology of cotton weaving had not yet taken hold in the established manner that the weaving of linen, wool, and silk had. Loose cotton tow, appropriate for stuffing soft objects, would have been its most recognized form. This neatly explains how the padded garments worn under armour received their name, as aketons were typically padded with cotton tow. 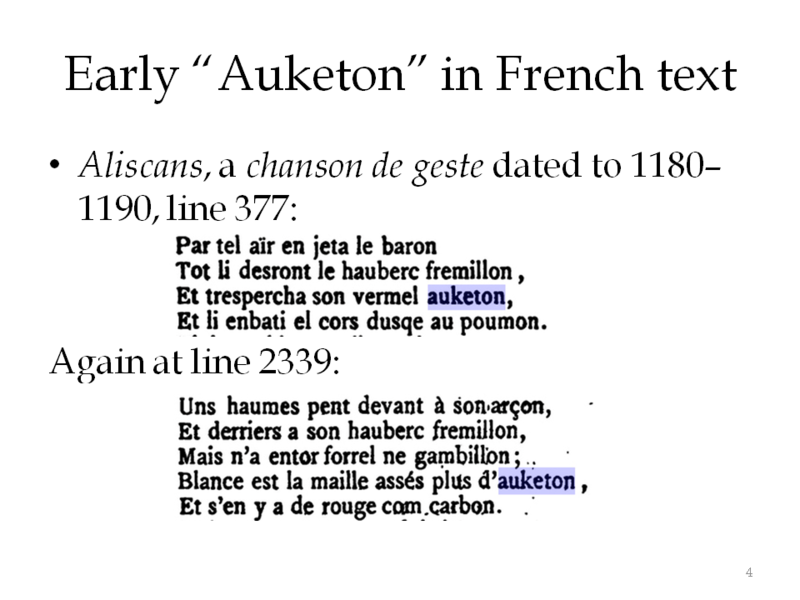 Early use of this word in French can be traced to Aliscans, a chanson de geste from the late 12th century.3 The author describes a violent cutting of a foe from helm to saddle, slicing through the mail and the padded coat beneath, which is first called a gambeson and then an aketon in a poetic repetitive description of the event. 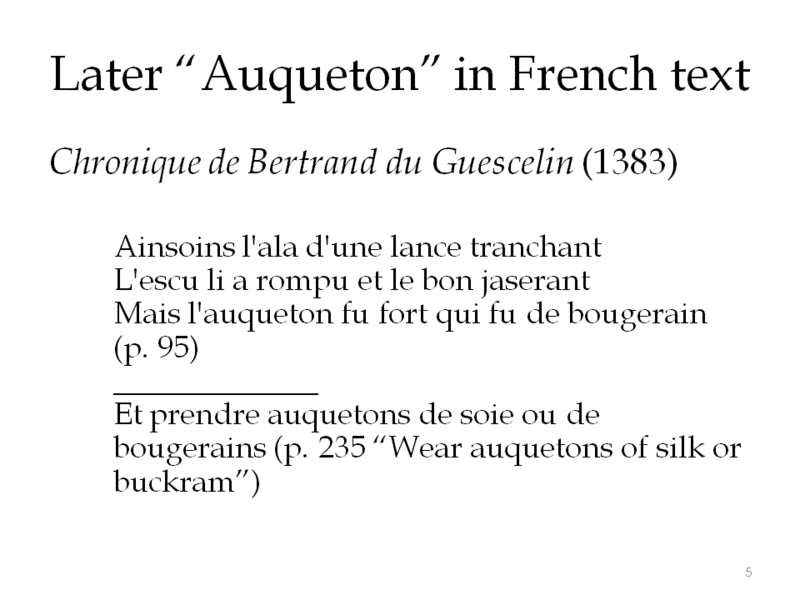 Worth noting is that the terms “gambeson” and “aketon” are used interchangeably in many texts of this period, extending through the 14th century. For simplicity’s sake, I have chosen to use the term aketon, with the understanding that it refers to the padded, quilted garment worn below hard armour. Some students of historical armour have claimed that the term “aketon” falls out of use during the 14th century, perhaps leaving the term “gambeson” to hold the field, or its upstart cousin, the word “doublet”. So, what did this necessary item look like? Figural imagery provides some answers, though a complete understanding of the garment cannot be known without access to surviving originals. 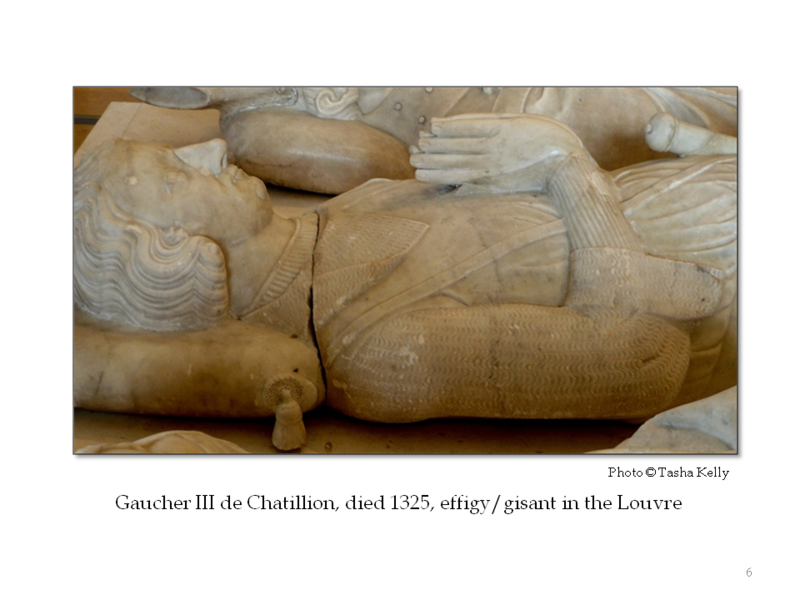 From this effigy or gisant of a French count likely sculpted around 1325, we see that his aketon was long-sleeved, as one would expect, given the coverage of mail on the arms, and quite finely quilted. Though the effigy sculptor gave us no evidence of closures, we may assume that the garment laced closed at the center front and probably along the close-fitting forearms as well. This 3-dimensional example, carved quite close to life-like, is a reminder that not all padded and quilted garments were made with wide, thickly-stuffed channels. In this next image dating to 1348, on the left, we see a rare example of what a contemporary illuminator understood the aketon to look like. The hem length is curiously long, however, as the 1340s heralded a notable shortening of the hem on all typical torso-covering armour, such as the hauberk, the coat of plates, the surcoat worn over it all, and certainly the aketon. This is attributable to the increased use of full plate armour covering the thighs. A more typical length in France at this time is to just above the knees. The figural record does tend to show the aketon as the longest layer, however, as can be seen in the image on the right, from an effigy dating to the same year. Though the aketon hid beneath layers of armour, it is reasonable to assume that its existence was known to the common people of its time, as it is well-represented in the texts and was seen on the roads, due to the heightened martial activity brought to France from England. Medieval men built their armour defense from the skin out and this would have been general knowledge in the 14th century. Their padded coats were the foundation of a martial defense and were the base upon which further armour was placed. For poorer men in a martial situation, a padded coat was sometimes all he had in the way of body protection. There can be no doubt that the appearance of a padded, quilted coat encouraged associations with combat and heroics, whether real or imagined. Given its ubiquitous and rather butch origins, it is no wonder that the aketon was appropriated for wear by men in peaceable everyday context. Since the historical record available to us is far from complete, we must guess how and when the wearing of padded, quilted garments as a peacetime fashion took hold, but we can return to the texts for clues. There exists some confusion about the origins and meaning of the word “pourpoint” among we members of the English diaspora which should be clarified before I go on. 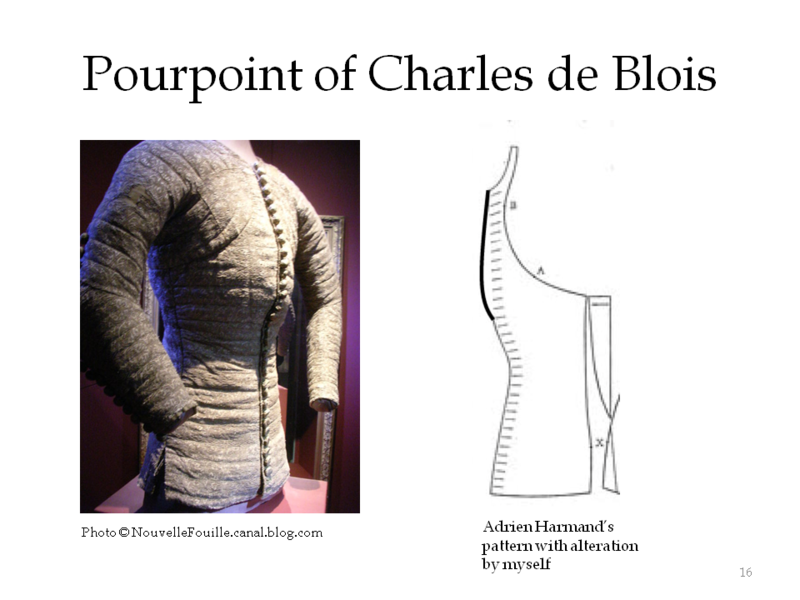 “Pourpoint” was the French term for a padded, quilted garment worn on the upper body. Its etymological origins are found in the Latin roots “perpunctus” and “propunctus”, which mean “pierced through” and “pierced” or “pricked” respectively.7 In the 14th century, the garment’s name refers to the excessive piercing of fabric during the quilting process. It does not, in fact, refer to the act of pointing one’s chausses or leg armour to the skirt of the garment. 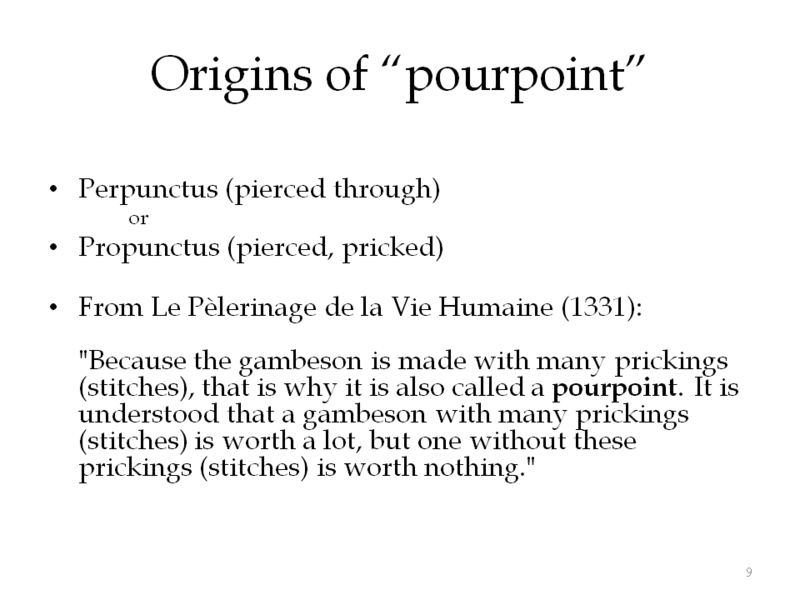 It is easy enough to read the word “pourpoint” and interpret the French word to mean “for pointing” in English but this is simply a coincidence of language. 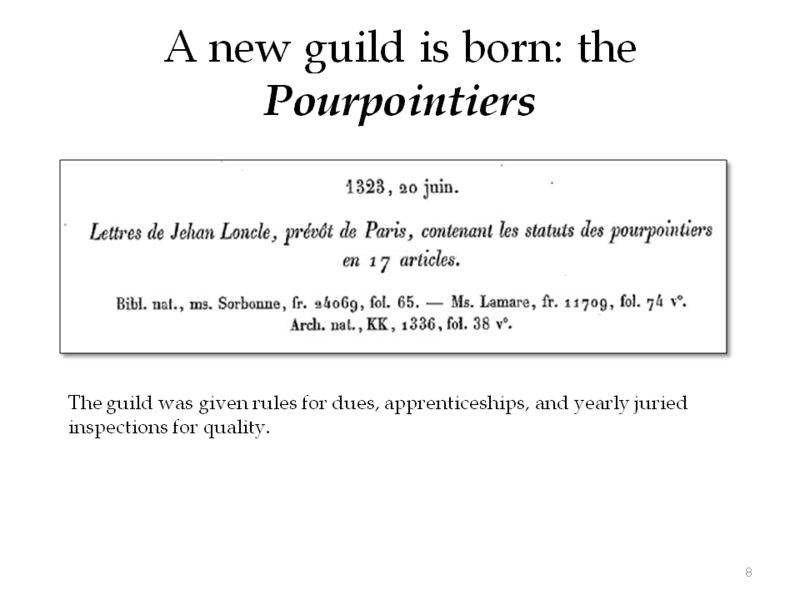 The creation of the pourpointier guild points to the rise in popularity and acceptability of the pourpoint within the first third of the century. 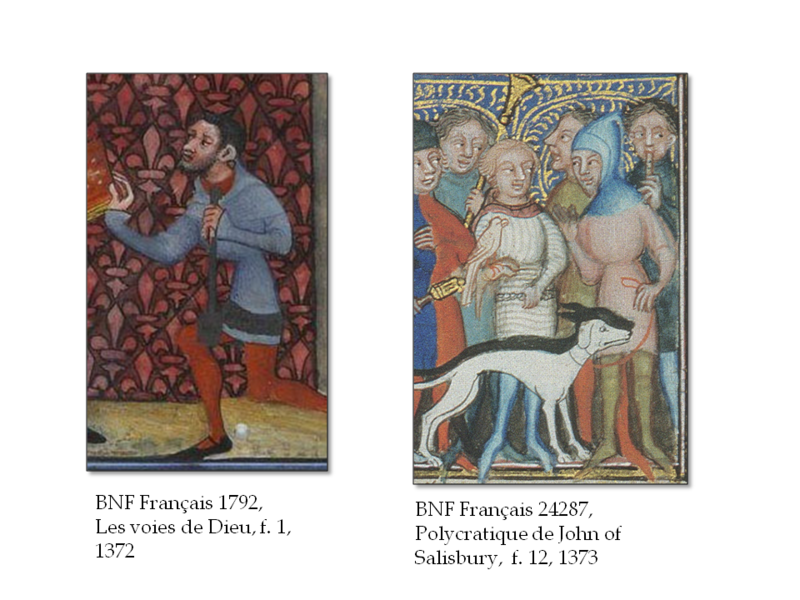 By a few decades later, illuminators were routinely including them in scenes depicting well-dressed men. The unnamed illuminator from figure 10 portrays the life of Saint Paul in a picture bible. Here we see non-Christianized Jewish men dressed fashionably. Note that the aggressor in the second scene is the only one wearing a pourpoint. 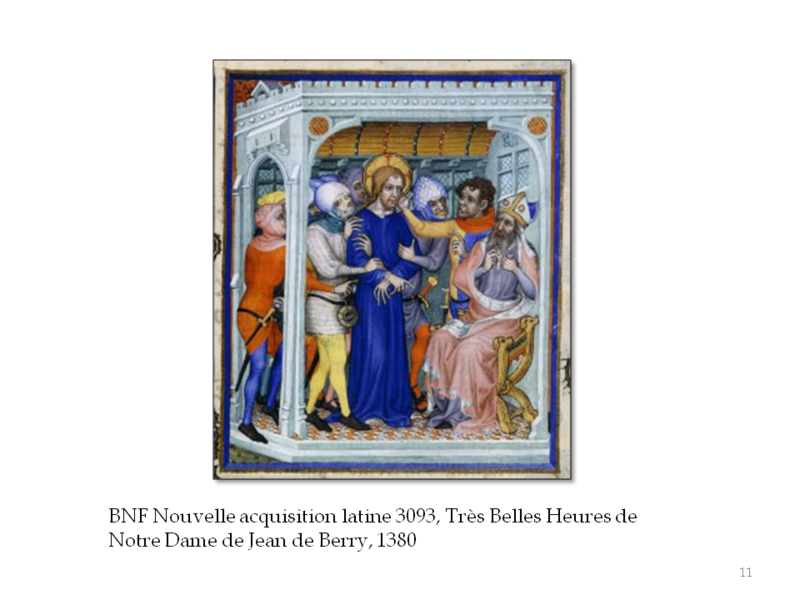 The theme that ties villainous behavior to vainglorious, tough-guy dress runs through 14th and early 15th century French illumination, particularly regarding Biblical topics. The soldier in the aketon in figure 11 is a typical example. The same illuminator who gave us the life of Paul in pictures portrays fashionable lords and ladies dancing outdoors in a different manuscript illustrating a romantic story written by Guillaume Machaut. This artist enjoyed portraying subtle variety in the fashions of his time, though the final effect is muted by the use of the grisaille technique.9 Two of the eight men in the scene are wearing pourpoints. 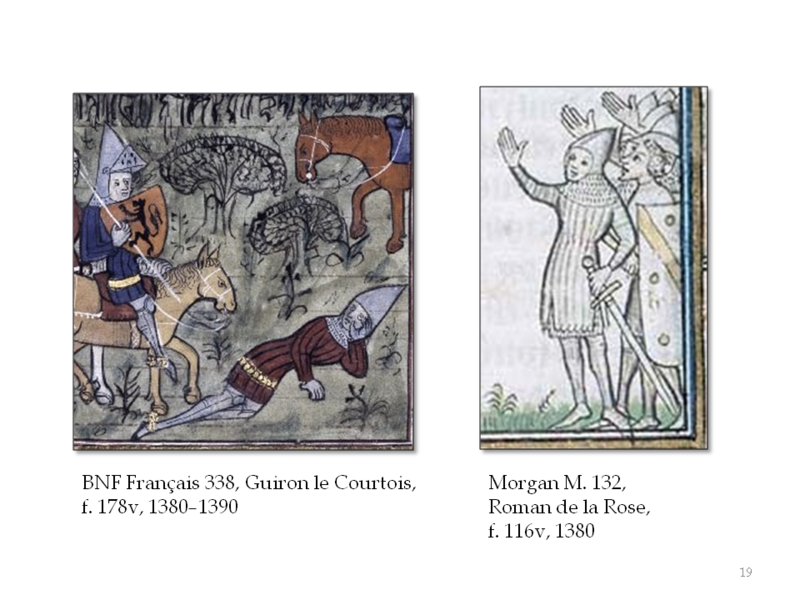 It is tempting to extrapolate that in 1350, about one quarter of the best-dressed men were wearing pourpoints on any given day. The sampling is far too small to be certain of that conclusion, but I doubt such a guess would be all that far from reality. In this final image from our artist in figure 12, we return to the same Bible Moralisée and note that a Philistine soldier in this scene from the story of Sampson and Delilah is wearing his aketon or perhaps a quilted surcotte over his armour. The artist rendered this martial example of quilting with vertical lines, while his civilian garments all have horizontal lines. Perhaps this served as a visual cue to the reader to recognize different purposes of padded, quilted garments? Nonetheless, the use of padded, quilted garments by this single artist draws a subtle connection among the the angry opponents of Paul, the flirting men, and the intimidating soldiers—all of them are men on a mission. As the 14th century headed into its second half, a new application for padding in non-martial clothing arose. In addition to the traditional tightly stuffed tubes, padding begun to create new shapes on the body, specifically in the chest and upper abdomen. By the mid-1350s, a gentle curve had begun to appear, which grew more pronounced as 1360s began. Not coincidentally, this curve matched the growing bulge on the chests of men in armour. For the same reasons men wished to evoke vitality and prowess by wearing garments reminiscent of the iconic aketon, men also wished to emulate the new chest-bulging silhouette of well-armoured men dressed for battle. Here is how that silhouette happened. 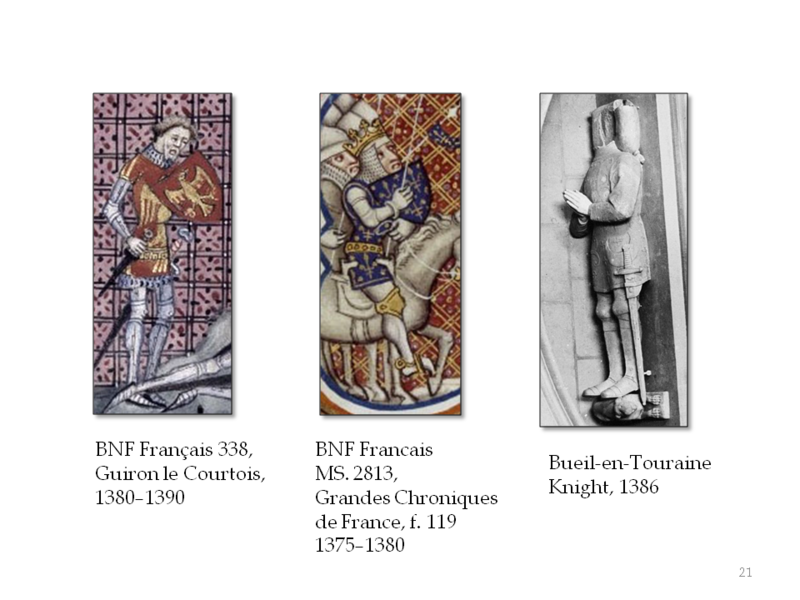 The constant state of warfare between England and France had predictably led to faster innovation in armour design, especially as metal workers were simultaneously improving the quality and size of individual steel outputs. This led to the use of larger plates in armour. To protect their midsection, men up until this point had relied on a combination of mail shirts and coats of plates, which consisted of smaller plates slightly overlapped and riveted to a flexible base such as leather or canvas. The nature of this construction left little room for shaping beyond the tubular, and indeed the visual depictions of men in armour bear this out. 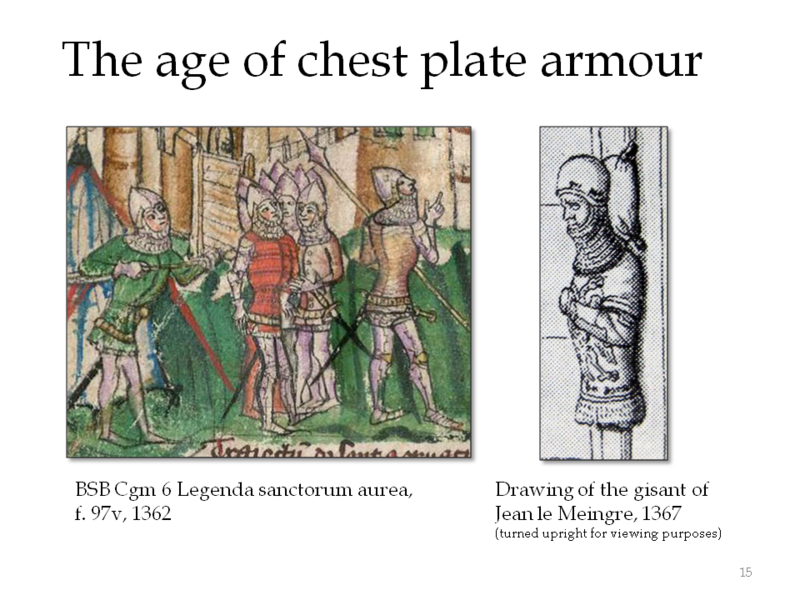 However, once the chest could be covered by one or two plates instead of multiple small ones, the armourers began to work progressively more curve into those larger shapes. Through practical experience, combatants knew of the defensive advantage that a domed surface would bring, having already seen how their helms and limb armour—mostly consisting of curved surfaces—deflected incoming blows off to the sides, away from the surface of the body. In addition, the concussive force of a blow was also distributed across the plate it hit, thereby acting as a shock dampener which kept the brunt of the trauma away from the surface of the body. 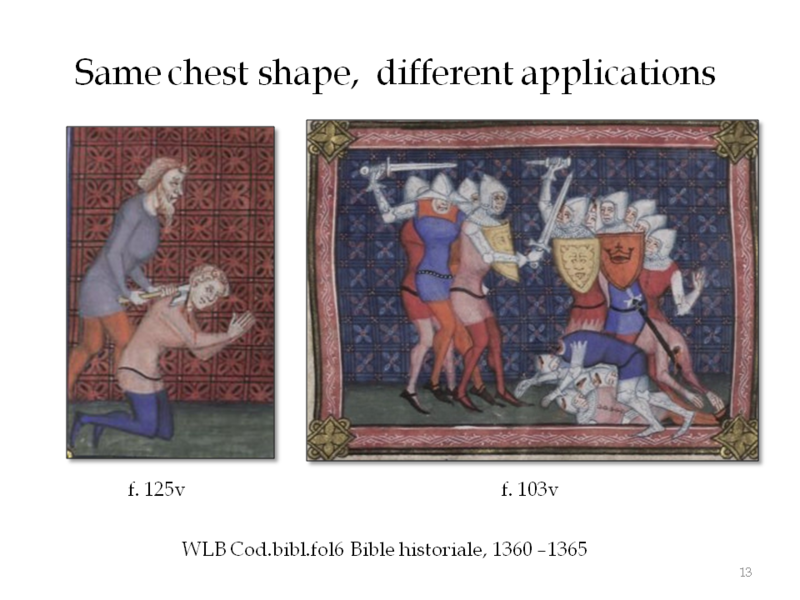 Before long, chest armour ceased to closely follow the natural male form and instead domed out from the chest. Regular fashion soon followed. The surviving fashionable pourpoint which belonged to Charles de Blois, the duke of Brittany, is preserved for us today at the Musée des Tissus in Lyon, France. It is solidly dated to the mid-1360s, and serves as an exemplar of the reshaped chest found in armour and in clothing at that time. Comparing this pourpoint to its martial counterpart’s silhouette provides striking evidence of the fashion-makers’ mimicry of the martially accoutered body shape. From the pattern piece shown in figure 16, we see that the extra shaping is cut into the center-front seam, which when sewn together as a garment, creates a distinct bulge. Options for holding this bulge to its shape on the body are several. 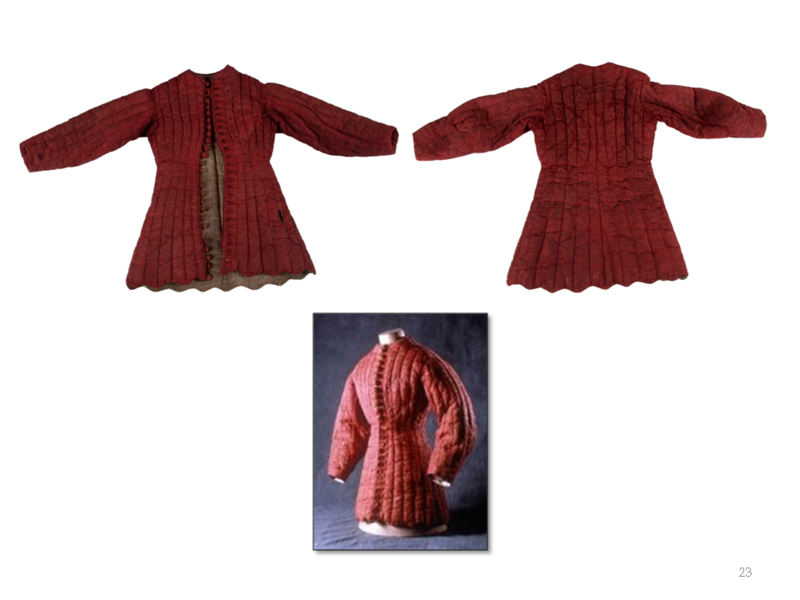 These include: increasing the padding in the chest and upper abdomen area; tightly-packing the wadding to make the front pieces exceptionally stiff; or a separate lace-up doublet worn beneath this garment which would have the padded shape built into it. A combination of these options may have also been in use. I have not examined this garment in person, so I can offer offer these educated guesses. 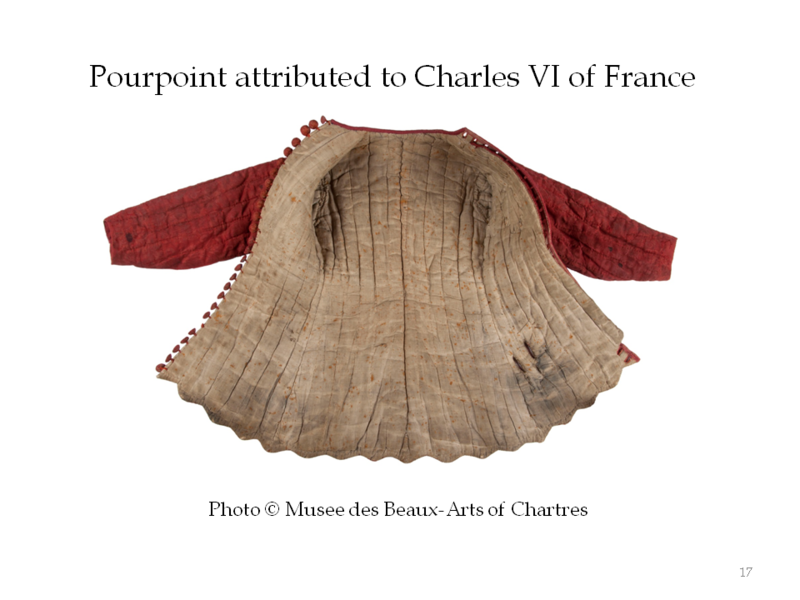 On the other hand, while examining the pourpoint of Charles VI, a child-sized martial garment which I have dated to approximately 1378 or 9, I found that the rounded chest shape of that garment was achieved using a combination of padding which was thicker in that area and also so densely packed that the front panels were stiff. This allowed them to hold their shape without support behind them. This could offer clues as to how such shaping was achieved for civilian purposes in addition to martial ones. In the case of this garment, the inside shape was curved outward enough to either leave empty space between it and the chest of its wearer, or space enough to wear a curved pair of plates or a single plate, perhaps. I think the latter is unlikely, however, because the garment is so narrow that additional layers of armour worn beneath the pourpoint would require this child to be so excessively skinny as to be emaciated. For a civilian application, a wearer could simply leave the empty space there between the body and the garment, and still enjoy the bulging shape caused by the stiffness of the padded channels. 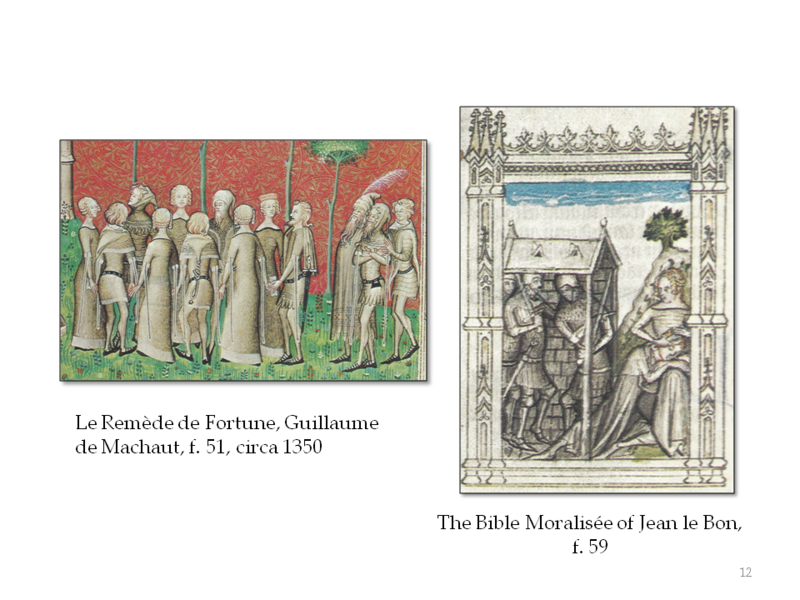 By the 1360s and certainly in the 1370s and -80s, we begin to see a maturity in the quilted fashions. The channels contain variability in shape and also in the height of the padding’s loft. Together, they are an effective technique for reshaping the masculine silhouette. In addition to the figural imagery’s portrayal of quilted garments, we begin to see men’s coats with no outward evidence of quilting, but plenty of padding, nonetheless. Notice that in figure 18, the two men on the right have the same bulging silhouette, but one is wearing a garment with no quilt lines. If the artists of the time are portraying these garments at least somewhat realistically, we can conclude that padding was inserted between interlining layers to build out the chest beneath the fashion fabric seen on the outside. Aside from the possibility of hidden channels stuffed with padding, a form of pad-stitching may have been used, which would hold the loose tow in place between the fabric layers. No matter the method used, this bold new silhouette spoke of a sophisticated tailoring effort akin to techniques used by modern suit-makers who employ multiple layers of fabric, hidden out of sight, to achieve a contrived, smooth shape on the male body. Men in peaceable contexts were clamoring for the shape of the curved breastplate, with or without quilt lines, and the tailors obliged them. As fashion trends remained fluid and ever changing, so did innovations in armour. 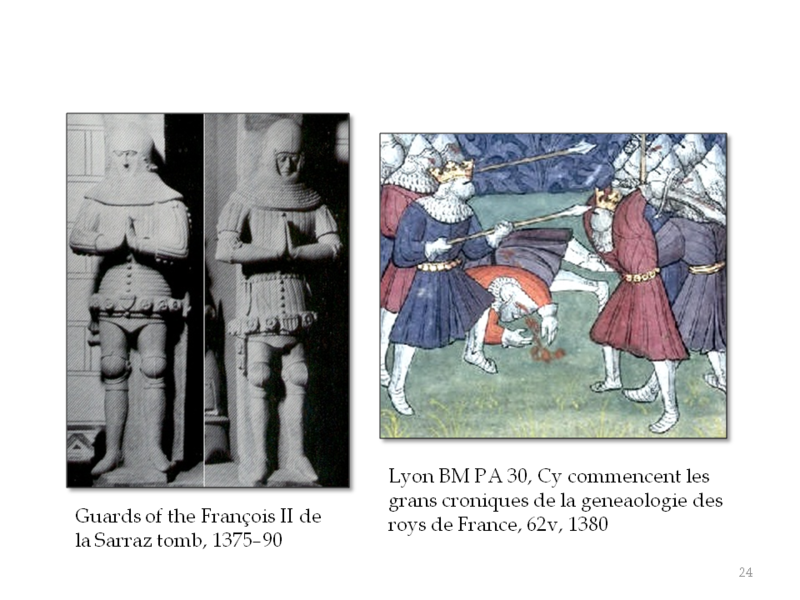 At about the time when the chest bulge was peaking both in its martial and non-martial contexts, men-at-arms in France adopted a new martial garment with visual roots in the respected aketon. But now, it had inspired a new padded and quilted garment to be worn as the top-most layer of the harness. 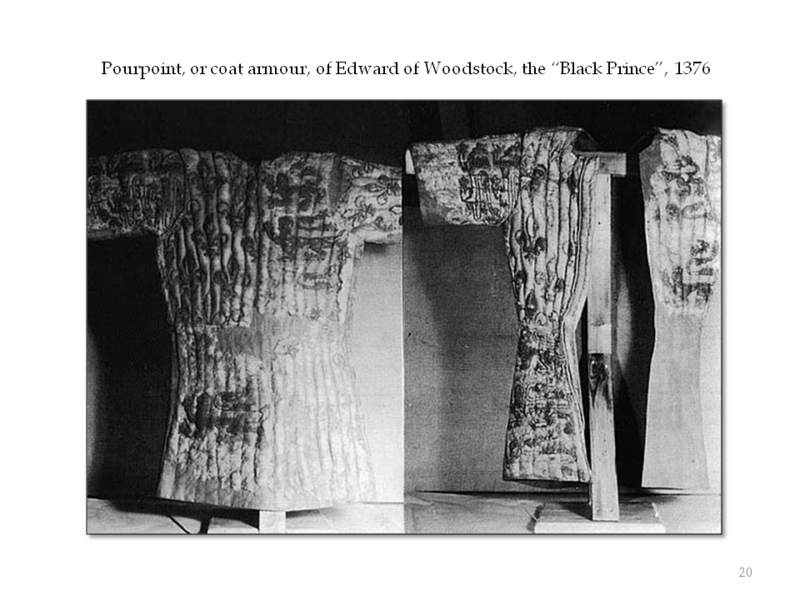 The term “coat-armour” was sometimes applied to these garments, which confirms that what was useful underneath the hard bits was also useful on top of them. Due to its visibility, the garment sometimes bore the heraldic arms of its wearer as a means of identification. It was important in these times to know who lurked beneath head-to-toe layers of metal. 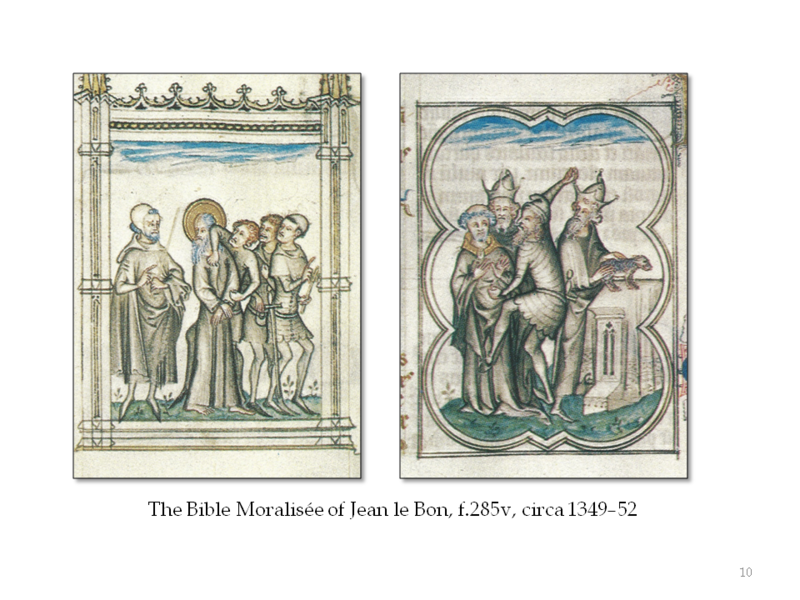 Noblemen were of great value as hostages and were frequently ransomed after capture during battle. Showing their arms openly served as a sort of “get out of jail expensively” card, which certainly was a better prospect than a violent or otherwise ignominous death. While England gets the credit for this garment due to its royal connection and home amongst the Black Prince’s funerary achievements in Canterbury Cathedral, it bears much closer resemblance to French martial fashion than to England’s. As the Prince spent more of his adult life in English-held French territory than in England, French ideas and fashions must have been well known to him and to some degree, embraced. This coat-armour even sports the short sleeves common to contemporary French figural art. Scholars have speculated that it may have originally had long sleeves based on a seventeenth century drawing of the funerary achievements. The sleeves, though short, were drawn with the full quartered device of England, rather than the two quarters seen on the garment itself today. This led to speculation that the sleeves had been shortened further at some point, but as Claude Blair asserted, sloppy mistakes were often made by heralds redrawing armorials, because, “they were only interested in coats of arms”.12 It is more plausible to assume that the sleeves are exactly the length they were meant to be originally, given the short sleeve’s popularity in coat-armours in France at that time. This is not to say that a long-sleeved variation was not also popular in France. The beautiful coat-armour attributed to a very young Charles the VI of France is a stunning example of the fully-developed expression of this new martial style. I can attest that it truly is armour, having held it in my hands and felt for myself its significant weight, stiffness, and thickness. The tell-tale stains of metal-tinged oil on its lining tells the tale as well. It is no small feat that 600 years after its creation, it still maintains its plumpness and shape. This was achieved through a complex layering of fabric and cotton tow, combined with a careful design of the quilted channels. As an extra benefit, it gave a strikingly wasp-waisted silhouette which has come to stand as the pinnacle of the European fourteenth century’s martial aesthetic. 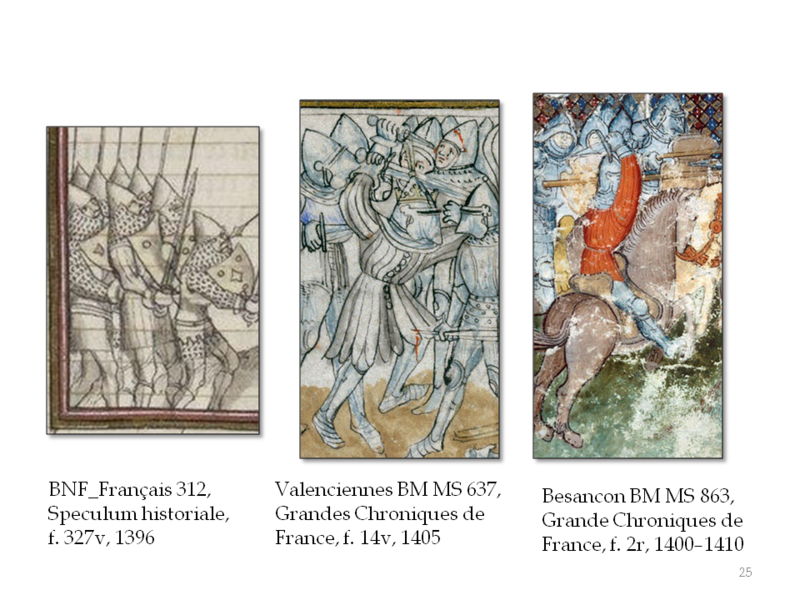 While coat-armour continued in popularity through the 1380s and into the 1390s, variations sprung up, as they inevitably do. In figure 24 we see both close fitting versions and looser, longer, more flowing versions. When a fashion’s popularity has risen to its highest point, there is a striking sameness to be found among the vast instances of it. When a fashion begins to fade, however, variation takes hold, signaling the restless desire to move into new sartorial territory. 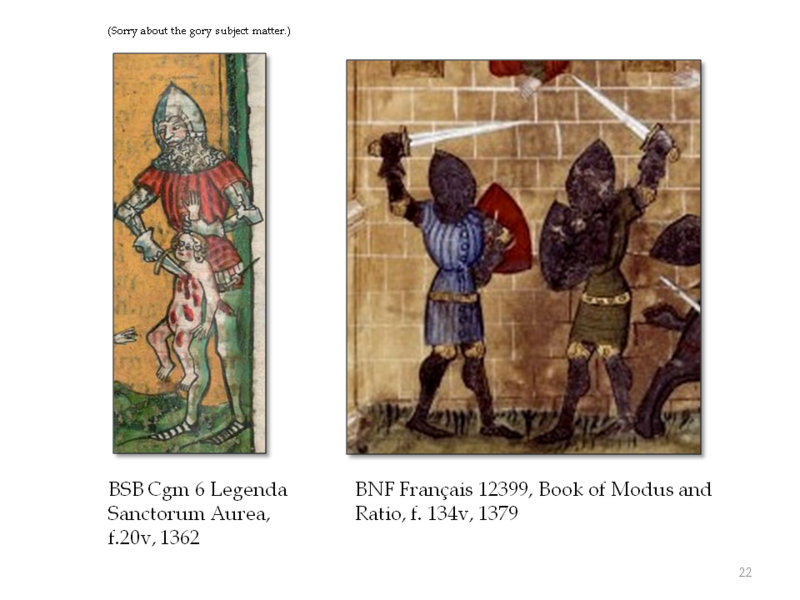 As the fifteenth century dawned, however, coat-armour hung on, for the most part, and could be seen here and there in the figural imagery well into the first decade. 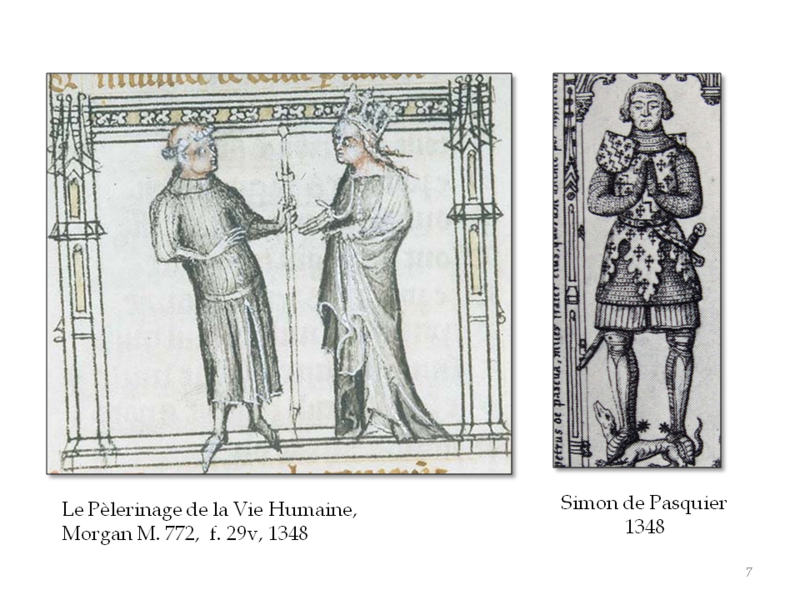 The tailoring techniques of padding and quilting were cornerstones of clothing history in 14th century France. The century’s beginning saw its service to the aketon, the humble partner to a mail shirt intended for torso protection during combat. It then found itself celebrated as the pourpoint, a peaceable fashion worn by men going about their daily lives. 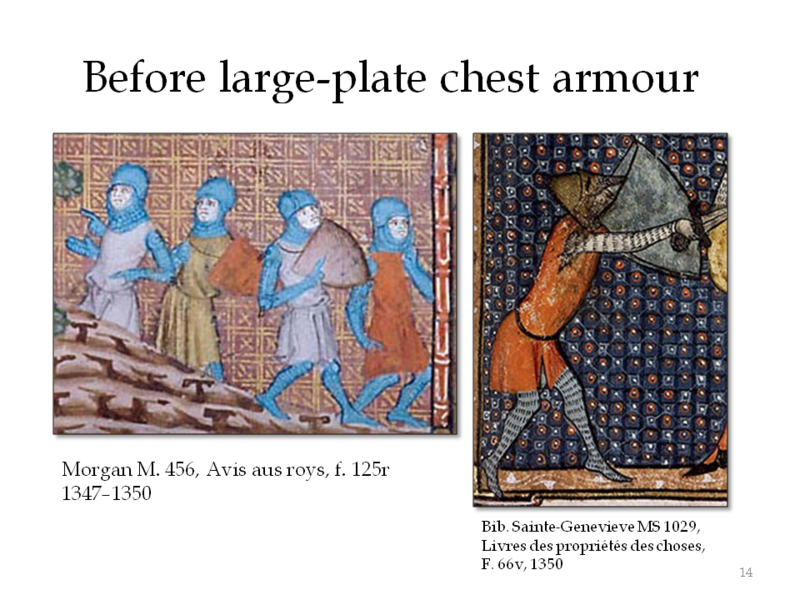 The evolution of metal plate technology heralded a new fashionable use for padding, which was to mimic the exaggerated roundness of the armoured chest. And finally, the early admiration of the aketon came back to the fore, with the rise of coat-armour, the finest and most iconic expression of France’s love affair with padding and quilting. Thank you very much for all of the research and effort that went into this endeavor . My attempts at “coat armour ” have lead me to believe that it may have been more prevalent than we presume . Well done. You are very welcome. It’s a labor of love. I really enjoyed reading your article. The illustrations were great.